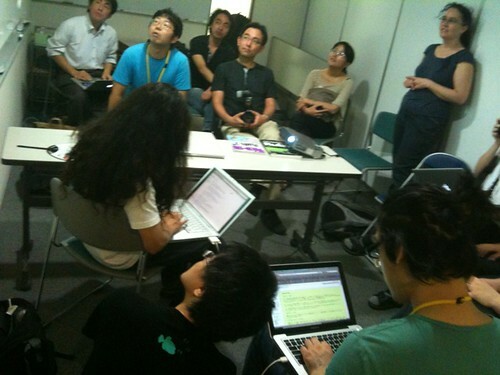 There were many who will speak at Ruby Kaigi and several Ruby Kaigi organizers who attended. I wish I had the whole list! After introductions, we enjoyed the warm hospitality of the Rubyists with much drinking and conversation. I had technical issues with my phone and couldn’t manage to take photos till the very end of the evening, but I will always remember this first evening with Japanese Rubyists where I felt we had more in common than we had differences. So happy for you two — all of you American Rubyists over there! Lovely to hear of feeling of communion among everyone. Very excited to hear your take on it all, Sarah. Keep the pics tweets & blog posts coming!